BEIJING, July 11 (Xinhua) -- Chinese State Councilor and Foreign Minister Wang Yi Wednesday held talks with foreign ministers of Palestine, Somalia, Mauritania, Tunisia, Yemen and Libya respectively. 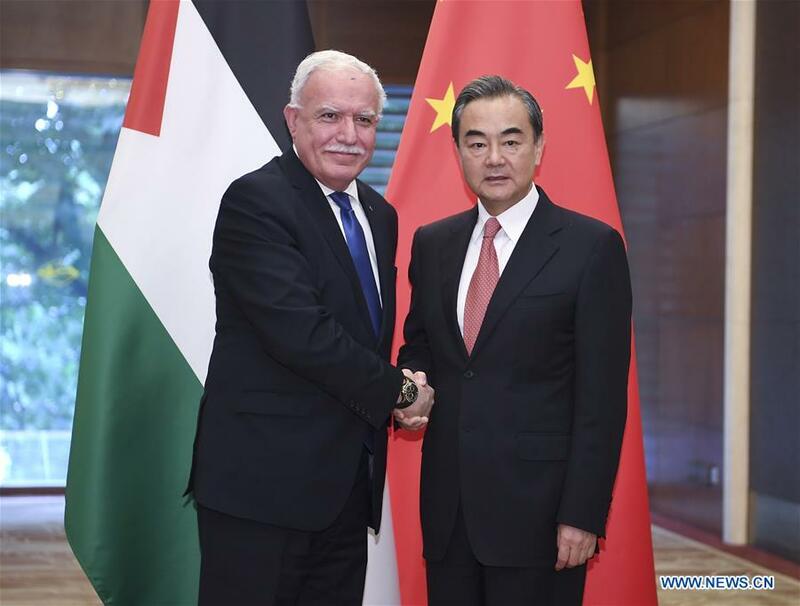 During the talks with Palestinian Foreign Minister Riyad al-Malki, Wang said China will continue to firmly support the just cause of the Palestinian people to restore their legitimate national rights, and the Palestine issue should not and will not be marginalized. He said Palestine's right to self-determination cannot be traded, nor their pursuit of independent statehood as well as their principles and dignity. Malki said Palestine is ready to deepen pragmatic cooperation with China under the framework of the Belt and Road Initiative. Palestine hopes China will play a greater role in promoting the early resumption of the peace process in the Middle East and the realization of the two-state solution, he said. During the talks with Somali Foreign Minister Ahmed Isse Awad, Wang said China will always support Somalia's efforts to safeguard its sovereignty, security and territorial integrity, and will support the Somali government in advancing the political process, promoting social reconciliation and improving governance ability. China is willing to support Somalia's peaceful reconstruction within its capabilities, Wang said. Awad said Somalia has always firmly adhered to the one-China policy. He said his country actively supports the Belt and Road Initiative and hopes to enhance cooperation with China in areas including infrastructural construction, agriculture, fishery, human resources development and capability-building. During his talks with Ismail Ould Cheikh Ahmed, Minister for Foreign Affairs and Cooperation of Mauritania, Wang said China is willing to enhance the Belt and Road construction so as to upgrade China-Mauritania cooperation. Ahmed said Mauritania attaches great importance to relations with China, adheres to the one-China policy and always supports China's efforts to safeguard its core interests. Mauritania backs the Belt and Road Initiative and would like to make the best use of the China-Arab States Cooperation Forum (CASCF) and the Forum on China-Africa Cooperation (FOCAC) to enhance cooperation with China in areas including infrastructural construction, agriculture and fishery, said Ahmed. During his meeting with Tunisian Foreign Minister Khemaies Jhinaoui, Wang called on both sides to implement the results of the CASCF and prepare for the FOCAC Beijing Summit to be held in September. He also encouraged both countries to strengthen cooperation under the Belt and Road framework, dig up both sides' potentials and continue to advance cooperation on major projects. Jhinaoui said Tunisia hopes to become a key pivot of the Belt and Road Initiative in North Africa. The two countries signed a MOU on the Belt and Road Initiative after the talks. During his meeting with Yemeni Foreign Minister Khaled Al-Yamani, Wang said China supports Yemen's efforts to safeguard national independence, sovereignty and territorial integrity. China backs Yemen's legitimate government and a political solution to the issue of Yemen, he said, adding that China will continue to provide assistance to Yemen within its capability, especially to help Yemen address the humanitarian crisis. Al-Yamani said Yemen looks forward to seeing China continue to play an important role on the issue of Yemen and welcomes China's active participation in its reconstruction process. During his talks with Mohammed Sayala, Foreign Minister of the Government of National Accord of Libya, Wang said China is willing to keep making efforts to promote the political settlement of the Libya issue, expressing the hope that the North African country will return to the track to peace, stability and rule of law at an early date. Sayala said Libya hopes China will actively participate in the country's reconstruction process and welcomes more Chinese investment in Libya. The two sides also signed a MOU on the Belt and Road Initiative. All the foreign ministers were here to attend the eighth ministerial meeting of CASCF held Tuesday in Beijing.